(Newser) – Three Republican state senators in Idaho skipped the chamber's daily invocation yesterday because they objected to the guest chaplain's religion. The three didn't take their seats until after Hindu cleric Rajan Zed had finished his prayer, which focused on selflessness, the AP reports. 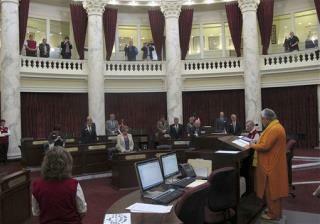 "Hindu is a false faith with false gods," said Sen. Sheryl Nuxoll. "I think it's great that Hindu people can practice their religion, but since we're the Senate, we're setting an example of what we, Idaho, believe." Another of the three, Sen. Steve Vick, had tried to have the prayer stopped, warning that a non-Christian prayer could "send a message we're not happy with the way America is," reports the Spokesman-Review. Before retiring I had the pleasure of supervising several nurses from India who were Hindu. Curiosity caused me to initiate many conversations about their religion and I was amazed at the number of Gods that religion has.....even they found humor about that. Seems they have a God for about everything. I don't remember much about the conversations on religion. What I do remember is that they were gentle, polite, humble, knowledgeable and hard working nurses and that's what was most important to the patients and to me. Please have pity for the poor Right Wing Christian Republican Conservatives. They are being PERSECUTED for being forced to be tolerant, respectful, unbiased and listen to another religion and another person religious belief, as in Hinduism. This is nothing but Christian PERSECUTION. Rajan Zed should run to closest Right Wing Christian Republican Conservatives to convert to Christians immediately. Afterward, he should only deliver opening invocation only Christianity. Who cares about Religious Freedom and Constitution? Christian Persecution! Christian Persecution! https://twitter.com/BettyBowers/status/484439289078755328/photo/1 If I discriminate/criticize you, it’s called religious freedom. If you return the favor, it’s called persecution. If shoe is on the other foot, these bigots will be screaming and yelling 24/7 on Right Wing media!